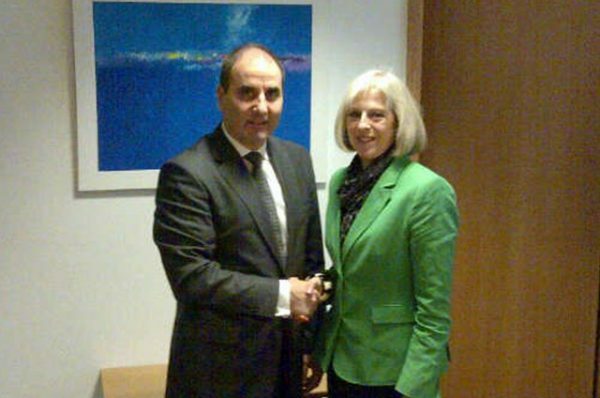 No doubt as a matter of course, Bulgarian Prime Minister Boiko Borissov will be cabling congratulations to his new counterpart in the United Kingdom, Theresa May. But for a succession of his interior ministers, May is a relatively known quantity because of bilateral meetings in the past six years. For Bulgaria, May also was the cause of a little chat in 2012 between the Bulgarian Foreign Ministry and the UK embassy in Sofia, after her comments at the time on the possible introduction of additional border controls, interpreted in the media as a measure to curb the entry into the UK of citizens of Bulgaria and Romania. In the light of more recent events, an occasion not without its irony. Theresa May became the UK’s home secretary in 2010, when the first Boiko Borissov government was in power. According to a Bulgarian Interior Ministry media statement from March 2011, then-interior minister Tsvetan Tsvetanov held talks with May, with the focus on the two countries working together in the fight against organised crime. Tsvetanov, the statement said, briefed May on the legislative changes in Bulgaria in the previous year and the then-upcoming amendments on the confiscation of assets acquired through crime, as well as the creation of special courts. Also discussed was an issue well-known to be important to May, the exchange of passenger name record (PNR) data. May was also told of the results of the visit by European Union officials to assess Bulgaria’s technical readiness to join the EU’s Schengen visa zone. Bulgaria, in 2016, is still not a member of Schengen. The UK never has been; and presumably, given Brexit on top of long-standing British refusal to join the Schengen zone, may never be. 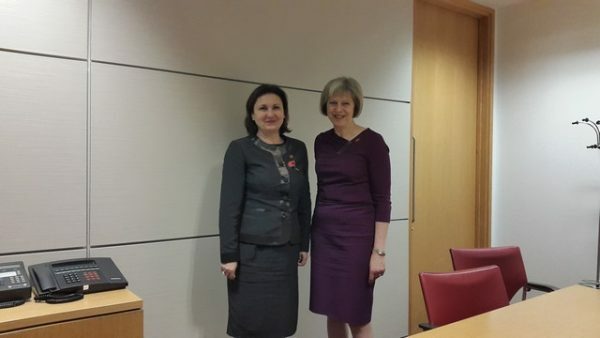 More recent talks between a Bulgarian interior minister and May took place in November 2015, when Roumyana Buchvarova, holder of the post in the second Borissov government, was in London. According to an Interior Ministry statement, May praised the “good co-operation” between the UK and Bulgaria in the field of security and law enforcement. Buchvarova and May discussed the migration crisis in the EU, the continuation of joint efforts to combat organised crime at national level and within the EU, the combating of terrorism and improving the efficiency of national security structures. Also discussed were reforms to the interior ministry structures of Bulgaria and of the UK – “a topical issue for both sides,” the Bulgarian Interior Ministry statement said. May, according the statement, described the “difficult but positive experience in the UK” and emphasised the need for transformation of the security structures of the UK and Europe, in accordance with today’s challenges. May said that the types of crimes that law enforcement structures must deal with today to ensure the security of citizens are different from those in the past, and this requires reforms. She emphasised the important role of new technology to increase the efficiency of police work, the statement said. Quite obviously, aside from those bilateral meetings about which statements – accompanied by photographs that appear to have been taken through a sock – had been issued, the respective interior ministers’ paths would have crossed at regular meetings of the EU’s justice and home affairs ministers. It was in October 2012 that the Bulgarian Foreign Ministry issued a statement saying that then-deputy foreign minister Ivan Naidenov had held talks with the UK embassy chargé d’affaires at the time, Catherine Barber. The talks were prompted by reported statements by Theresa May on the possible introduction of additional border controls, interpreted in the media as a measure to curb the flow of Romanians and Bulgarians into the UK. Hindsight on this 2012 statement makes it one to relish. Bulgaria’s Foreign Ministry said that Naidenov had said that “such statements by a senior British government representative undermines the foundation of the European Union, where freedom of movement is one of the four fundamental freedoms”. The Foreign Ministry statement said that Naidenov had “noted that this (May’s) position does not correspond to the stated commitment by the government of the UK “to promoting growth in the EU through the strengthening of the single market”. Mentioning of Bulgaria and Romania in such a context would be unacceptable, as this would be a sign of inequality, Naidenov said. The Bulgarian Foreign Ministry statement said that Barber had assured the Bulgarian side that May had not mentioned Bulgaria and Romania in the interview in question. May’s statement had been in connection with a strategic review of the relationships of countries in the EU, envisaged to be completed in 2014 before the parliamentary elections. By then, labour market restrictions on Bulgarians and Romanians would have been dropped, Barber said. And again with hindsight, no need to underline the ironies related to that, in thick stubby pencil, is there?